How I Feel About Books: My First Storytime with SRVS! The backstory behind my library program for adults with disabilities is explained here. Two weeks ago today, on August 13, 2015, I held my first library program for two classes of adults with disabilities from SRVS! I was pretty nervous because my experience of reading aloud is limited to my one-year-old. I picked two books I really loved because I knew I'd be comfortable reading them aloud. Bonus: both books are really funny, so I knew my audience would be laughing! 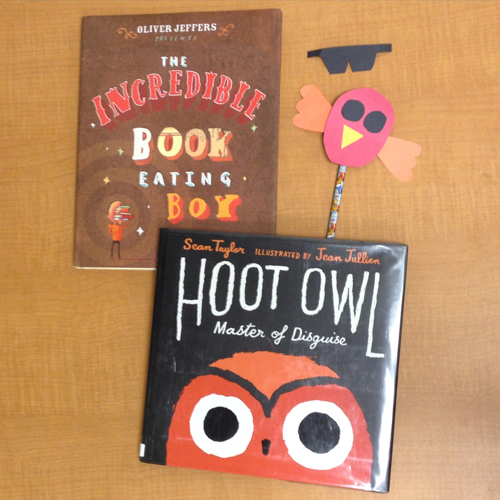 I started with The Incredible Book Eating Boy by Oliver Jeffers, then read Hoot Owl, Master of Disguise by Sean Taylor, illustrated by Jean Jullien. The craft was to make Hoot Owl pencil toppers out of construction paper. I pre-cut all the pieces for the owl because we have a little less than an hour for this program. The individuals glued them together, then taped the owl to their pencil. A SRVS teacher and I took requests from the individuals and we made disguises for each owl! See the super cool spy glasses pictured above. This program was so much fun to lead, and I'm excited to continue it every month. I can't wait to see how it grows and develops into more!